The Honor Play 8A has been launched in China last week in two RAM/storage variants. The phone is a successor to the Honor 7A. 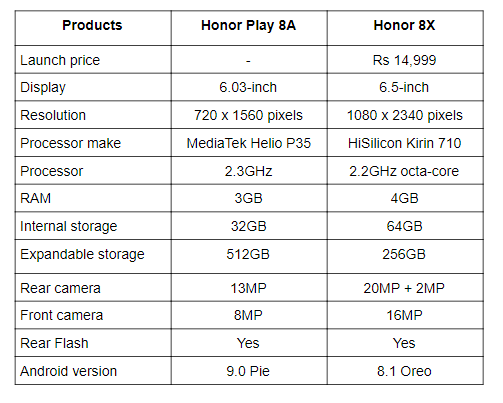 We are comparing it with the Honor 8X to know which device would be the right buy among these two? The Honor 8A has been the talk of the town for quite a period of time. The phone was leaked on TENNA earlier then revealed on the Chinese website called Weibo. Finally, the smartphone got launched in China last week with a MediaTek chipset. On the other hand, the Honor 8X is another mid-range segment device by the company that is powered by a Kirin 710 octa-core processor. We are comparing these two smartphones to see which one will be the right choice in terms of specifications? The Honor Play 8A sports a 6.03-inch display that offers a resolution of 720 x 1560 pixels, while the Honor 8X features a slightly bigger 6.05-inch display that comes with a resolution of 1080 x 2340 pixels. 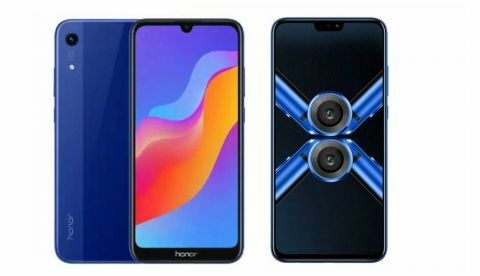 The Honor Play 8A has a water-drop notch on top of it, which houses the front-facing camera, while the Honor 8X has a traditional notch. Coming to the processor, the Honor 8X is powered by a Kirin 710 octa-core processor, which is paired with 4GB RAM and 64GB internal memory. On the other hand, the Honor Play 8A is backed by a MediaTek Helio P70 processor, which is clocked at 2.3GHz. When it comes to the cameras, the Honor Play 8A has a single 13MP unit on the back along with an 8MP sensor on the front, while the Honor 8X has a dual 20MP + 2MP rear cameras with a 16MP sensor at the front. The Honor 8X is available in three variants 4GB/64GB, 6GB,64GB, and 6GB/128GB models. The base variant is priced at Rs 14,999 in India. On the other side, the Honor Play 8A India launch has not been confirmed by the company yet.